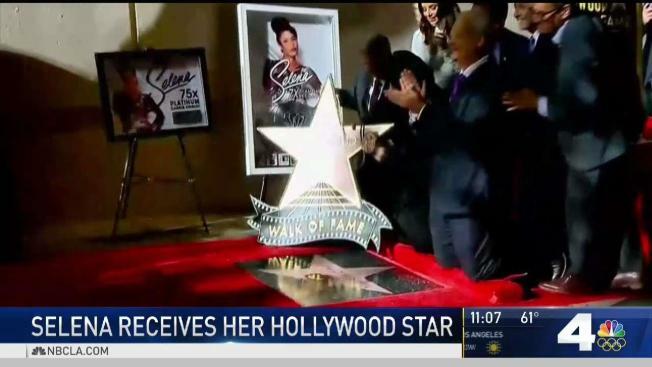 "I come across so many different nationalities who say, 'I love your sister'"
Fans of beloved Tejano superstar Selena gathered Friday in Hollywood, where a Walk of Fame star was unveiled in honor of the legendary singer. On the eve of the star ceremony on the Hollywood Walk of fame, her sister reflected on her legacy. Suzette Quintanilla said she was thrilled that her sister, the "Queen of Tejano," is getting a star 22 years after her death. "She would be totally freaking out about the star," she told NBC4 Los Angeles in a phone interview before the event in front of the Capitol Records building, "where it all started." The Grammy Award-winning Mexican-American singer was 23 years old when she was fatally shot by the president of her fan club in March 1995. She was honored with the 2,622nd star Friday evening on the Hollywood Walk of Fame. "Since day one of Selena's selection into the Walk of Fame, not a day went by that we were not asked by fans when Selena would get her star," said Ana Martinez, producer of the Walk of Fame ceremonies. "This day has come and fans from around the world will rejoice in her well-deserved honor." Quintanilla accepted the star for her sister. She said she continues to hear from fans across ethnic lines. "Selena's music and her legacy is multicultural," she said. "I come across so many different nationalities who say, 'I love your sister.'" "She had real values and she let everyone know that," Quintanilla added. "I hope that people can look at her and realize that their dreams are attainable." Selena, born in April 1971 in Texas, was the youngest of the Quintanilla children. She debuted in 1980 with her siblings in the family band, "Selena y Los Dinos." She rose to stardom in the mid-1980s and won Female Vocalist of the Year at the 1986 Tejano Music Awards. She signed with new LA record label EMI Latin in 1989 and released the first of her five albums, which included songs like "Bidi, Bidi Bom Bom," "Dreaming of You," "No Me Queda Mas," "Amor Prohibido" and "Como La Flor." Selena was killed on March 31, 1995. Two years later, the film "Selena," starring Jennifer Lopez, was released. Her music continues to span generations -- as of 2015, she has sold more than 65 million albums worldwide.